Recently I was on a phototrip to southern Patagonia with my friend Tano. Exploring another fascinating part of the earth, once without a snowboard. Sunrise in front of the Fitz Roy. After a short and windy night in the tent. 5.00 am. But still we had a lot of gear. Carrying all the camera equipment, food and trekking gear with us added up quite heavily. But by all means it is worth the effort. The mountains around El Chalten (Fitz Roy and Cerro Torre especially) are the most impressive mountains I have ever seen. They are renowned for their difficult ascend because of their huge vertical granite walls. In addition the weather can be very treacherous. We encountered fabulous weather but still we preferred to stay on the scenic trekking paths. Not less spectacular are the mountains a bit further south in Chile. 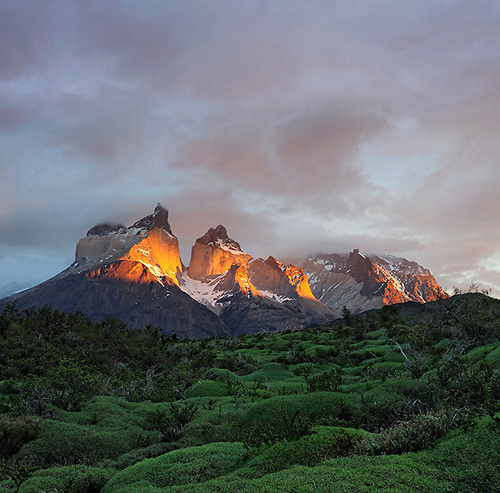 The Torres del Paine national park is a wonderful place as well. Cuernos del Paine, Chile. The light on the mountains was there only for 2 minutes before the whole scene went gray.